In spite of the high volume of film documentaries, journalistic pieces and random Google searches that now educate us, the long exhaustive story of one of America’s greatest singing groups seems to hardly get told enough. Often when it is told, it’s done in embarrassing fractions due to the excessive volume of information (or the lack thereof). Sometimes it’s misaligned with the kind of chatter that’s direct purpose is to tease the ears. It is obviously true that the Temptations – one of Motown’s greatest imports to the world of 20th century music – deserve the accolades and sweet-nothings that come with undaunted glory. At the height of their commercial peak, the beloved quartet was Top 40 gods with over thirty-seven hits in their pocket. Their majestic blend of tight harmonies, fancy footwork and polished stage presence, along with their infamous strategy to feature alternate leads proved to work its magic well beyond the comforts of R&B. Pop audiences wanted in on their soulful stuff as well, pushing Paul Simon to work with the Dixie Hummingbirds on “Loves Me Like a Rock” and the Rolling Stones to cover “My Girl” and “Ain’t Too Proud to Beg.” In 2010, Phil Collins dedicated a whole album to Motown’s big hits; four of them were from the Temptations. It is without question that their influence proved to be contagious worldwide. Even when the Seventies rolled around, the Temps – now safely reconfigured under the auspice of ambitious songwriter and producer Norman Whitfield – were more than eager to make the necessary changes to stay relevant and contemporary. 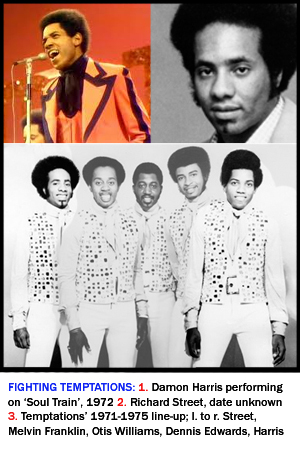 Plenty Motown legends fell off the gravy train by 1970, but thanks to the psychedelic direction of Whitfield on hits like “Cloud Nine,” “Run Away Child, Running Wild,” “Psychedelic Shack,” “Ball of Confusion” and their ultimate jaw-dropping masterpiece “Papa Was a Rolling Stone,” the Temps managed to stay alive. They had plenty of reasons to cave in: David Ruffin and Eddie Kendrick both left the group for solo ventures; Motown was moving west and closing a difficult chapter on the infamous Studio A formula; an ill Paul Williams had no other choice but to depart as a group member, then suddenly succumbing to suicide in 1973; drug and alcohol abuse ran rampant in the anthology, particularly in the lives of Ruffin and Williams. By the mid-Seventies, their shining star had practically faded from the conscious of pop music, limiting them only to black audiences. These well known facts about the Temptations provide us enough evidence on how easy it is for pop stars to lose their luster and to become a part of the forgotten. Just three years ago, Ali-Ollie Woodson, another beloved member of the Temp organization, also succumbed unexpectedly. His greatest contribution to the Temps’ legacy took place at the very start of his tenure with the group. The No. 2 r&b hit “Treat Her Like a Lady,” which missed the Top 40 at number 48, was co-written between Otis Williams and Woodson. It featured a stunning musical update led by Philly soul acolyte Victor Carstarphen. Woodson also played keyboards on the session, alongside important Earth, Wind & Fire contributors Al McKay and Ralph Johnson. Today, the song continues to reverberate on old-school r&b radio and is best remembered as one of the group’s treasured latter-day hits. It feels a bit freaky knowing that the Great Orchestrator in the heavenlies would allow this procession of bad events to be bookended by a 35-minute documentary on TVOne’s praised ‘Unsung’ series about the life of Eddie Kendricks, who was often dubbed “The Thin Man” by the thousands and “Cornbread” to close loved ones. The special also aired on February 27, the same day Richard Street passed away in a Las Vegas hospital. The fast-paced made-for-TV doc usually rises to and beyond the occasion in packaging together a healthy presentation of facts and worthy talking points, celebrating the totality of an “unsung” musician. In the case of the episode surrounding Kendrick, who later added an “s” to his last name for reasons unknown which the show failed to discuss, the TVOne special barely met its quota of superior journalism. Although the episode featured in-depth details on Kendrick’s notorious cig addiction and a supporting cast of family members (Patricia Kendrick) and Motown stars (Martha Reeves, Mary Wilson, Dennis Edwards) who knew the singer better than most, it was void of childhood photos, a bit slacking of interview footage and barely scraped the surface of his solo career. Legendary Motown founder Berry Gordy has contributed to Unsung specials in the past (Teena Marie), but he failed to show up for on this one, for whatever reasons. Luckily, Dennis Edwards was in place to wrap a shiny red bow around the event. 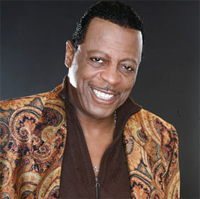 Despite only working with Kendrick for a brief period during the Tempts’ golden era and collaborating with him off and on during the “reunion” period up to his passing, Edwards’s sincere account about Kendrick’s last days spoke volumes. “I’ve never seen Eddie do drugs,” Edwards said. “Eddie’s bad boy was a pack of cigarettes. It got to the point where he didn’t want us to see him smoke.” While on a specialty tour billed as “Original Lead Singers of the Temptations,” Ruffin unexpectedly died from a drug overdose in 1991. Meanwhile, Kendrick’s health started to deteriorate rapidly. In October of the same year, Kendrick had his right lung removed and returned to a rigorous schedule of touring with Edwards. By the end of the summer of ’92, Kendrick retired for good in his hometown of Birmingham, Ala. until his dying day on October 5. 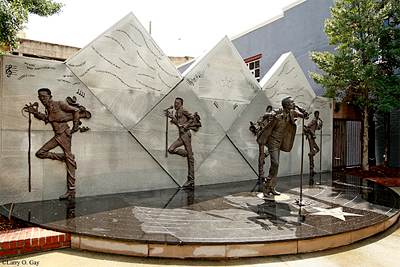 The TV special did hearken on one importance piece of Kendricks trivia: the Eddie Kendrick Memorial Park, located in the heart of Downtown Birmingham within the quarters of the historic 4th Avenue business district. Erected in his honor in 1999, the park features a Ron McDowell-designed bronze sculpture of Kendricks with an elaborate background featuring his hardworking sidekicks laid against a fine piece of granite wall. Despite the historical greatness that surrounds their humble beginnings in Detroit, the city of Birmingham, Ala. is also significant to the backdrop of the Temptations’ story, since Kendrick, born in Alabama’ Union Springs, was raised for the better part of his early life in the city. It is there where he teamed up with Birmingham native Paul Williams to form the Cavaliers before becoming the Primes and then migrating up north to Detroit seeking stardom as musicians. The Temptations’ first manager Johnnie Mae Matthews, who cut the Distants very first set of singles (“Come On, “Alright”), was also born in Birmingham. Dennis Edwards, the group’s only living lead singer, hails from Fairfield, Alabama, a neighboring city eight miles west of Birmingham. The TV documentary rewarded Birmingham with a great sense of pride for their participation in making one of the world’s greatest institutions in pop music. 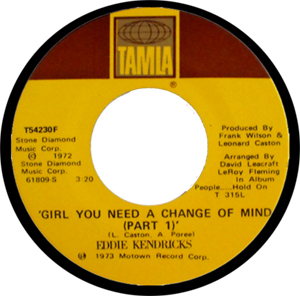 Thanks to 1973’s “Girl You Need a Change of Mind,” Kendricks gave the burgeoning disco movement in New York something exceptional to boogie to. The Temptones with Daryl Hall pictured in back embrace their Motown inspirations. Kendricks’ solo catalog was more vast and complex than “Keep on Truckin’” could ever hint at. ‘Unsung’ could have also explored the depths of his Live at the Apollo gig in ’85 with pop/rock superstars Daryl Hall & John Oates. Although the special briefly tapped on the career highlight, Both Hall and Oates were highly influenced by the Temps’ soul. With a little Inspector Gadget magic from their research team, Unsung could have unraveled another important document in music history. Unknown to most of the public, Hall (Hohl) once sung in a Philly-based white doo-wop/soul group named the Temptones. 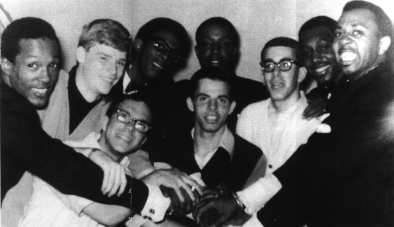 The Temptations eventually met the aspiring group backstage at the Uptown Theatre and later became friends with the young Hohl. Oates later joined the Temptones as their guitarist. Although the lifespan of the Temptones proved to be quite short, this important footnote in music history proved to be the nucleus behind the hit-making regimen of Hall & Oates. And how could anyone forget about the Temps’ 1989 induction into the Rock and Roll Hall of Fame? Footage from that special reunion, with Hall & Oates introducing them, could’ve easily landed upon the final cut. Considering the time factor, it’s almost impossible to squeeze all of these colorful details into a 35-minute special. The life of a Temptation seems to be full of ups and downs. If not too careful, the outsider could easily augment the assumption that there have been more downers than uppers. For those who are impervious to dig into the vast consciousness of rock history, the lifestyle of a proud rock ‘n roller has never been easy. Certainly it comes with instant fame and a shitload of glamour, but it’s always been a hard knock life. For the Temptations, it’s been extra hard. But hard work usually pays off in the end. Sometimes it’s at the finality of life that the reward is made present. Whether it’s with an ‘Unsung’ special, or a Rock & Roll Hall of Fame induction, or with one of those Lifetime Achievement tokens at those glitzy award shows or even with one of those memorial parks erected in your hometown, the Temptations are finally reaping what they sowed. Lucky for us, they’ve laid down a mighty good foundation for many a group to build off of. Excellent article. As a big fan of The Temps, you did a great job!